Here are all the major stats and numbers recorded during the 2018/19 Ranji Trophy season. 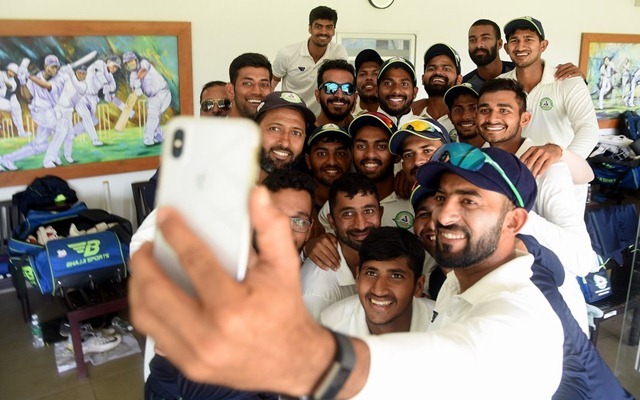 Vidarbha were successful in defending their Ranji Trophy title with a clinical victory in the final against Saurashtra at their home venue, Nagpur. The Faiz Fazal-led side showed consistency throughout the tournament as they finished as the toppers of the Elite Group A and B. The 2018/19 season was played with as many as 37 teams including nine teams added from this season. The new teams were placed in the Plate Group which produced some new records in the tournament’s history. 7 – As many as seven bowlers claimed 50 and more wickets in this Ranji Trophy season. Rajasthan’s Aniket Choudhary fell one wicket short of fifty. The previous highest was by four different bowlers in the 1999/00 season. The six hat-tricks recorded in this Ranji season are also the most in a single season. 26.94 – Aggregate batting average in this Ranji Trophy season; the lowest since the 2007/08 edition where the average was 26.88. Each of the last ten Ranji seasons had a batting average of over 28. 2 – Wasim Jaffer became the first player in Ranji Trophy history to score over 1000 runs in two different seasons. Jaffer scored 1037 runs from 15 innings in this season. He scored 1260 runs in the 2008/09 seasons where he won the title with Mumbai. 8 – Paras Dogra now holds the record for scoring the most number of double centuries by a player in Ranji Trophy. His 8th double century came for Puducherry against Sikkim in Wayanad where he scored 253. Dogra, thus surpassed the seven 200s by Ajay Sharma for Delhi. Each of Dogra’s previous seven double tons were recorded for his home team Himachal Pradesh. 68 – Ashutosh Aman of Bihar claimed 68 wickets in this season; the highest in a single Ranji Trophy season. Aman thus went past Bishan Bedi, who claimed 64 wickets for Delhi in the 1974/75 season. 149 – Wasim Jaffer now holds the record for the most number of Ranji Trophy appearances as he went past Devendra Bundela’s 145 games during the last group stage match against Saurashtra. Jaffer also holds the record of the most runs (11775), the most centuries (40), the most fifty-plus scores (86) and the most catches as a fielder (197). 351 – Naman Ojha went past Vinayak Samant’s 335 dismissals behind the stumps to become the wicketkeeper with the most number of dismissals in Ranji Trophy. Ojha claimed this record during the game against Hyderabad in Indore. 372 – The 372-run chase by Saurashtra in the quarter-final game against Uttar Pradesh is the highest successful run-chase in the Ranji Trophy history. They went past Assam’s successful chase of 371 in the 2008/09 edition of the tournament against Services. 267* – Ajay Rohera’s unbeaten 267-knock for Madhya Pradesh against Hyderabad is the highest individual score on Ranji Trophy debut as well as on the first-class debut. In this process, Rohera went past Amol Muzumdar’s 260 for Bombay against Haryana in the 1993/94 season. 343 – Puneet Bisht of Meghalaya scored 343 against Sikkim which is the highest individual innings and the only triple century recorded in this Ranji Trophy season. This 343 is also the highest individual innings in first-class cricket by a wicketkeeper. He thus surpassed Minod Ranasinghe’s 342 for Sinhalese Sports Club against Badureliya Sports Club in Sri Lanka’s Premier League Tournament in 2015/16. 409 – Pankaj Singh, playing for Puducherry in this season, became the first pacer in the Ranji Trophy history to bag 400 wickets in the history of Ranji Trophy. Vinay Kumar stands second in the list of most Ranji wickets by pacers with 397 to his name. 18 – Pankaj has bagged a 5-wicket haul against 18 different opponents in Ranji Trophy; the most by any player. He went past Sunil Joshi in this season as the former Indian International had a 5-fer against 16 different Ranji teams. 1331 – Sikkim’s Milind Kumar aggregated 1331 runs from 14 innings in this season; the second most runs by any player in Ranji Trophy season. VVS Laxman also scored 1415 runs from 14 innings for Hyderabad in the 1999/00 season. 121 – Milind Kumar of Sikkim had a batting average of 121 in this season having scored 1331 runs from only 14 innings with six centuries and four fifties. Among the players with 1000 runs in a Ranji season, only Rusi Modi (201.6) in 1944/45 and WV Raman (145.42) in 1988/89 had a better batting average.